There are many simple bible verses about adultery and marriage that you should know if you want to follow Jesus Christ in the stairway to heaven. This law was given by God to Moses to give and be followed to the people of God, Israelite (Exodo 20:14). When Jesus came and saved all of us, he also gives the clearer explanations about it. We can read it in the Gospel of Matthew, Luke, and Mark. We try to examine the Gospel in Matthew. 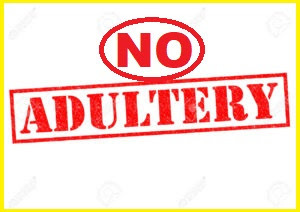 Matthew 19:9 - And I say unto you, whosoever shall put away his wife, except [it be] for fornication, and shall marry another, committed adultery: and whoso married her who is put away doth commit adultery. This verse simply showing that everyone will commit adultery when married to another man or woman. But if the husband be dead, the woman is loosed from that Law. We can read it to the book of Paul. Romans 7:2 - For the woman which hath an husband is bound by the law to [her] husband so long as he lives; but if the husband be dead, she is loosed from the law of [her] husband. It is very clear that marrying is not a joke, unlike any food that when it is tired of eating it can easily be extinguished. So, select the best partner in life as husband or wife. Any suggestions and comments are welcome. Just leave a comment below. "Love isn't just a feeling. It's an art. And like any art, it takes not only inspiration but also a lot of work." Women must be Love, not to make her cry.